This recipe is straight from my mother's cookbook. She had come across the name of the dish somewhere and knew that it had something to do with nutmeg but had no idea about the recipe. So she decided to make a dish using nutmeg and mutton with her own recipe. The dish came out fantastic and everyone at home simply loved it. 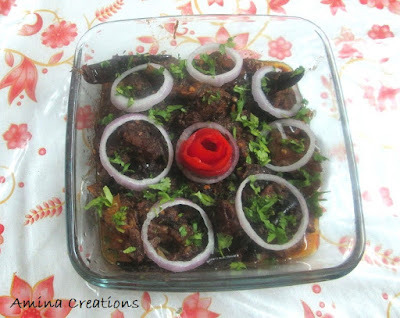 Sharing her recipe here so that my readers too can try this out and relish. Take the mutton pieces in a bowl, add garlic paste, grated nutmeg and salt and mix well. Allow the mutton to marinate for at least half an hour. Then heat oil in a frying pan, add dry red chillies and fry them till they turn crisp. Next add the marinated mutton pieces and fry in oil for 5 to 10 minutes till they slightly change colour. Now transfer the entire contents to a pressure cooker and add 1 cup of water. Close the lid and pressure cook for 3 to 4 whistles. 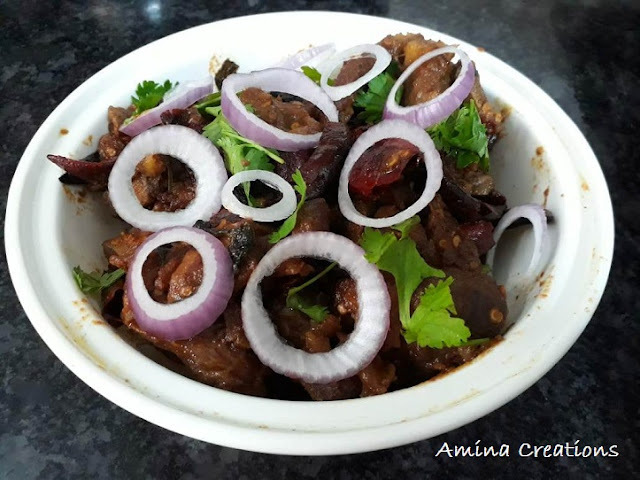 Transfer the cooked mutton to serving bowls, garnish with sliced onions and coriander leaves and your Jungli mutton is ready to be served.